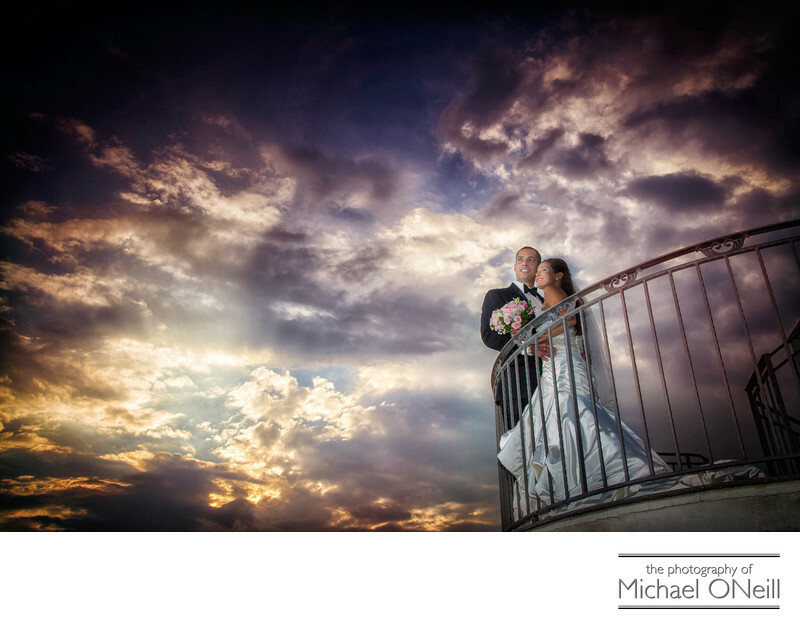 The Venetian Yacht Club overlooks the Great South Bay in Babylon, New York and never fails to deliver some of the most incredible Long Island sunset wedding pictures. I’ve been working with the folks at this incredible waterfront facility for as long as they’ve been open and have quite a collection of amazing sunset photographs from this venue. Every one is a little bit different and every one is spectacular. (Much like the wedding couples themselves)! This couple had their wedding ceremony at Our Lady of Lourdes RC Church in Massapequa, NY and stopped for photographs at Argyle Lake Park on Montauk Highway in Babylon for photos before heading to The Venetian Yacht Club for cocktails and their dinner reception. I always tell my bridal couples that I’ll be watching and monitoring the sun as it sets and will alert them at the perfect time. You generally only have a small window of opportunity (usually just two or three minutes) in which to capture any given sunset perfectly. This dramatic image took less than two minutes to create from the time I notified the bride and groom to the time they were back inside partying with their friends and family. If you are planning a wedding at The Venetian Yacht Club I’m sure you’ve already heard of me and have seen some of my award-winning wedding photography. If you would like to see some more and discuss your plans for the big day, give me a call. I would love the opportunity to work with you and create that perfect sunset image for you, too.